"Time For Kids" magazine and Slooh Community Observatory are teaming up to explore the five naked-eye planets, all of which will be visible in the sky on Aug. 16. 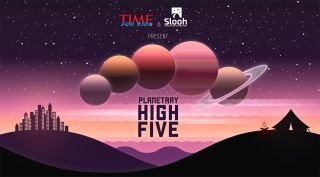 Kids can celebrate a planetary "high five" tonight by tuning in to the online Slooh Community Observatory's special broadcast to show off the five naked-eye planets, starting today (Aug. 16) at 6 p.m. EDT (2200 GMT). Slooh will also show the view from its Constellation Cam for 3 hours beforehand. Slooh is partnering with "Time For Kids" magazine to talk about Mercury, Venus, Mars, Saturn and Jupiter, all of which are in the sky right now at the same time. The broadcast will show kids where to find these planets in the sky right from their own backyards, and also through Slooh's telescopes in Spain's Canary Islands. Budding astronomers can watch the live coverage on Slooh's website. Viewers can participate by tweeting @slooh or taking part in the broadcast's live chat. You can also watch the planet webcast on Space.com, courtesy of Slooh. "While many describe this event as an 'alignment,' the planets don't actually line up," Slooh representatives said in a statement. "Rather, they'll appear in two groups. Mercury, Venus and Jupiter will appear together low in the western sky at dusk local time, so keep an eye out for them as the sun sets where you live. Meanwhile, Mars and Saturn will rise high in the southern sky, forming a triangle with the bright star Antares." Slooh astronomer Eric Edelman will take viewers on a tour through the skies, explaining how the planets move and how this leads to planetary groupings. For part of the broadcast, Bing Quock, assistant director of the Morrison Planetarium at San Francisco's California Academy of Sciences, will discuss Saturn. The telescope will zoom in on the planet as Quock and Edelman discuss the possibility of life on Saturn's icy moons. Edelman also will be joined by Josh Richards, a finalist in the Mars One project. Mars One is a private organization planning to send the first human expedition to the Red Planet. Richards will discuss why he wants to go to Mars, especially considering he won't be offered a ride home. For 3 hours before the show, Slooh will make its Constellation Cam available to use virtually. This will allow kids to see Mars, Saturn and the star Antares and take pictures of them.